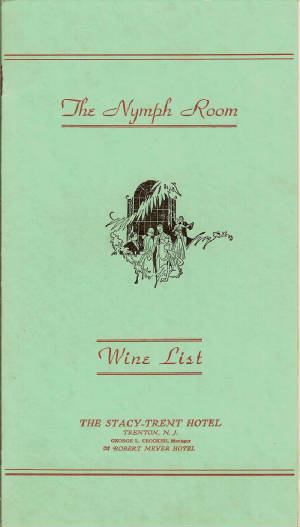 This page lists the wine list from the Nymph Room. Although the list is undated, its approximate age can be determined by its reference to the Stacy-Trent as a Robert Meyer Hotel, which was between 1934-1946, and the 1938 bonded date of one of the whiskeys. Many of the listed items do not have a price, but I have included them as a historical reflection of the era. A "Pony" refers to a "pony," which is 1 fluid ounce; "Nips" refers to a "nip," which is 1.6 fluid ounces; "Spts." refers to a "split," which is 6 fluid ounces; "Pts." refers to a "pint," which is 16 fluid ounces; and "Qts." refers to a "quart," which is 32 fluid ounces. Imported Grand Chambertin, 1916, Still, Half Bottle..